Situated in a quiet Westville neighbourhood, near the end of a tree-lined cul-de-sac with boomed access control, you will find this stylish family home with a seamless indoor/outdoor flow. 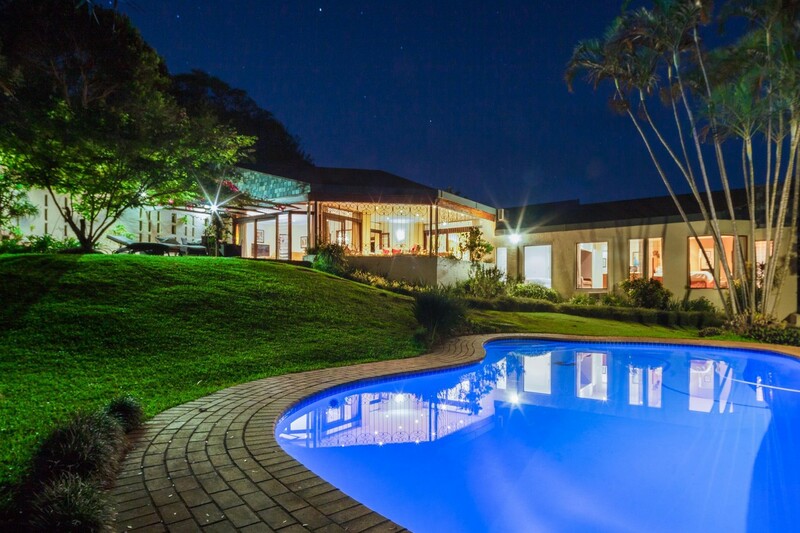 Perfect for nature lovers and entertainers alike, this private five bedroom home features two and a half bathrooms, a large kitchen, two living rooms, enclosed entertainment area, outdoor patio, indigenous garden, swimming pool, double auto-garage, storeroom and a separate music room. From the lofty entrance hall, the home fans out to the kitchen, living rooms and outdoor entertainment area. The dining room; which features downlighting, air conditioning and vinyl flooring; is connected to the Tv lounge via a reading nook with a built-in window seat and a glass brick wall. The Tv lounge is characterised by a decorative statement wall, fireplace enclave and large glass windows and doors that gracefully fill the room with natural light. Both living rooms feature glass sliding doors that guide you into the covered entertainment area that is enclosed with decorative wrought iron bars to take full advantage of the tranquil garden views and create a light and airy sunroom feel that brings the outdoors indoors. Both the Tv lounge and the covered entertainment area flow directly out onto the open outdoor patio, which features a bougainvillaea pergola and stunning views over the swimming pool and indigenous gardens. If you love to entertain at home, then these interconnected indoor/outdoor living spaces offer the perfect place to lounge next to the pool, light the braai on the patio, dine alfresco under the pergola, or lounge in the sun-soaked veranda whilst taking in the views of the surrounding landscape. The light and spacious L-shaped kitchen wraps around a central courtyard and boasts large picture windows, loads of cupboard space, a breakfast nook, walk-in pantry, scullery and a separate laundry room. The sun-drenched courtyard would make an ideal outdoor breakfast dining area or even a great place to cultivate your very own herb garden. Down a passageway, you will find a modern family bathroom and all five bedrooms. The fifth bedroom includes built-in shelves and would make an ideal guest room or study. All bedrooms feature a large picture window that looks out onto the vast indigenous garden and lets in loads of natural light. The substantial Master Bedroom features a walk-in dresser with floor to ceiling fitted wardrobes and a contemporary en-suite bathroom that comes complete with underfloor heating, a jet spa bath, and a walk-in shower. At the bottom of the garden, and separate from the main house, you will also find an air-conditioned and soundproof music room for the budding musicians in the family. The room could be easily converted into a pub, pool house, games room or home office.